THE “YACHT PORT CARTAGENA” WITH EMILIO AZOFRA AT THE HELM THE MURCIAN TEAM HAS HAD AN EXCELLENT PERFORMANCE. THEY WON THE LAST RACE ENDING AT 3 POINTS OF THE CURRENT WORLD CHAMPIONS. 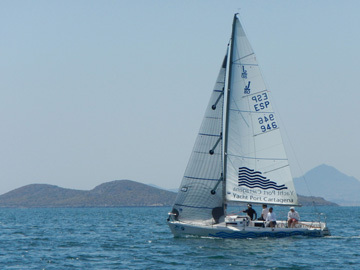 The VI Championship of Spain J/80 class was disputed on the waters of Mar Menor of Murcia between September 20 and 23.